Fishing is all over the Eastern Sierra. You can practically fish out your back door if there is a stream running by. 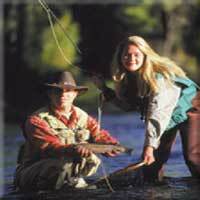 But to get the best experience, you will want to hire a guide to take you to one of the back country lakes. While there is no lake called "Mammoth Lake" the town is still full of them. There are 5 lakes in the Mammoth Lakes Basin, and just outside of town, there is Crowley Lake and Convict Lake. If you're going into the mountains, you may want a mountain guide. With a guide who knows their way, you are out for a real treat into the wilderness to fish at a stream or one of the lakes, you can only get to via foot or horseback. This is summer time in the Eastern Sierra at its best! For first time trout fishing having a guide teach you the secrets which will make the sport so much more enjoyable. There are a few key questions to ask your guide. Fishing is a family sport. These guides can help with your adventure.